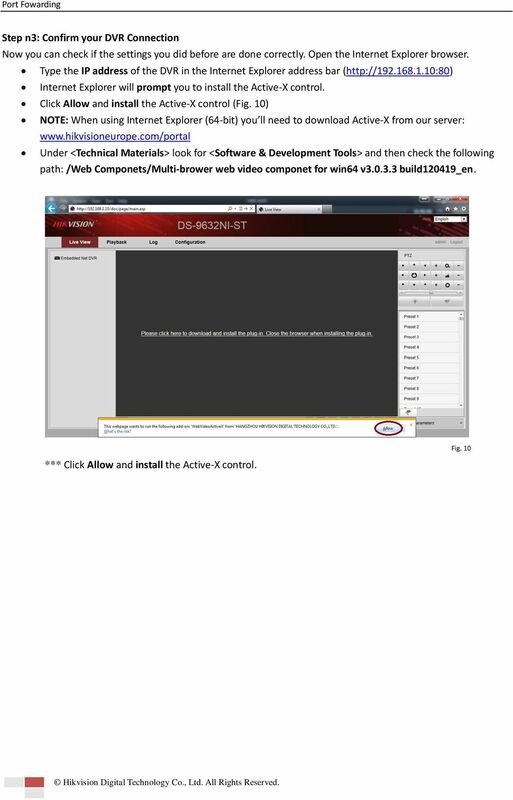 Download "How to Remotely Access Hikvision Devices User Manual"
1 HIKVISION EUROPE B.V. How to Remotely Access Hikvision Devices User Manual (Use to remotely access Hikvision DVR s, NVR s and IP Cameras) Name: Remote Access Publisher: HIKVISION EUROPE B.V. 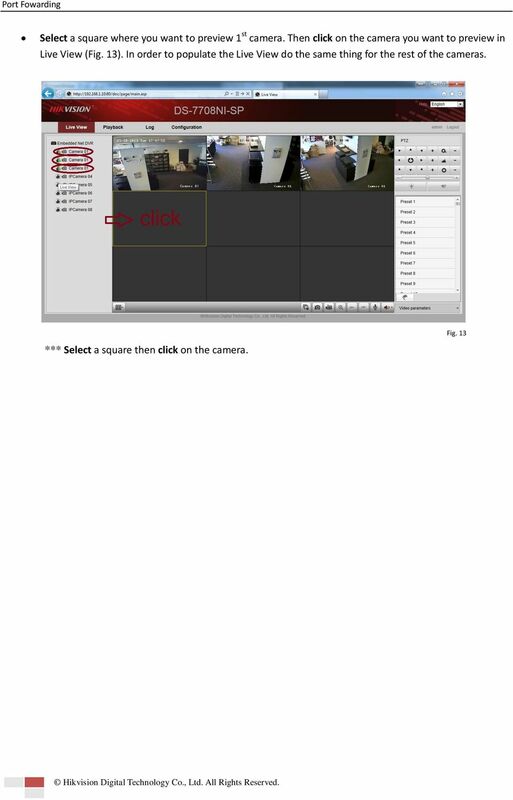 Type: Information Only Version: 1.2 File: N/A Hikvision Europe B.V.
3 Step n2: Static or Dynamic IP address. Now check for an open or free IP address on the network. Make sure to use an IP address that is in the same subnet range. (Example: if your gateway is you want to check for an IP address available like or and so forth) 2.1 Option 1 (static local IP address) a) You can check the IP address availability by performing the Ping command (Fig. 2). In order to do that you need to type ping at the command prompt window. If there is a reply it means that the IP address is already in use: *** Type ping at the command prompt window. Fig. 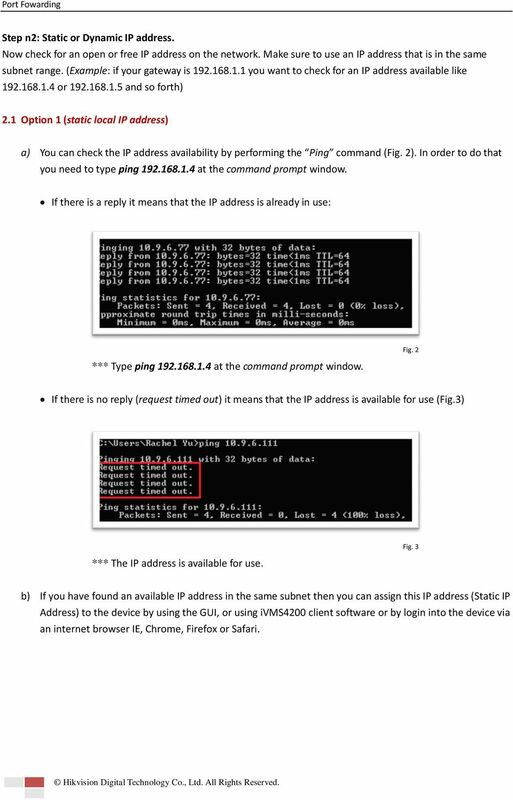 2 If there is no reply (request timed out) it means that the IP address is available for use (Fig.3) *** The IP address is available for use. Fig. 3 b) If you have found an available IP address in the same subnet then you can assign this IP address (Static IP Address) to the device by using the GUI, or using ivms4200 client software or by login into the device via an internet browser IE, Chrome, Firefox or Safari. 4 Using the GUI In Live View mode right click with a mouse to access the Main Menu. 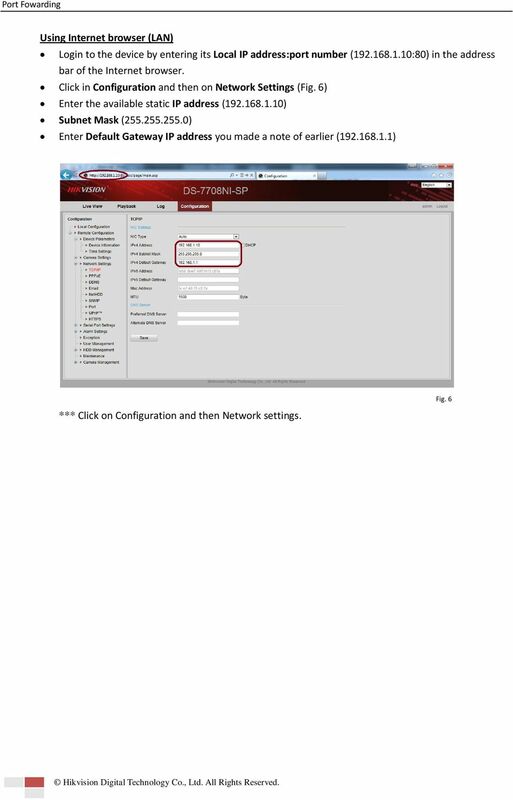 Click on Configuration and then Network (Fig. 4) Enter the available static IP address ( ) Subnet Mask ( ) Enter Default Gateway IP address you made a note of earlier ( ) Fig. 4 *** Enter the available static IP address. 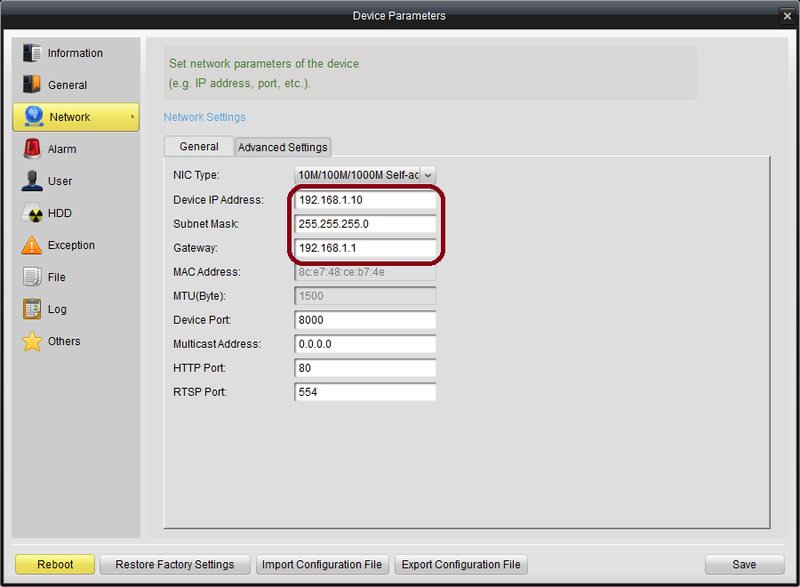 7 2.2 Option 2 (Dynamic IP address) a) You can enable the DHCP checkbox in the DVR Network Configuration interface: Using the GUI In Live View mode right click with a mouse to access the Main Menu. 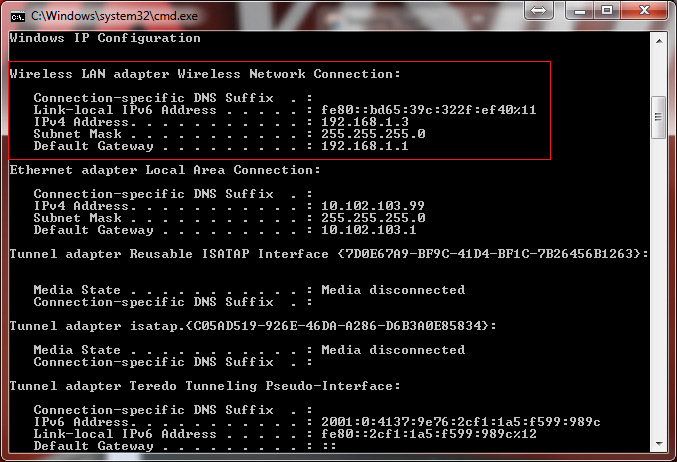 Click on Configuration and then Network (Fig. 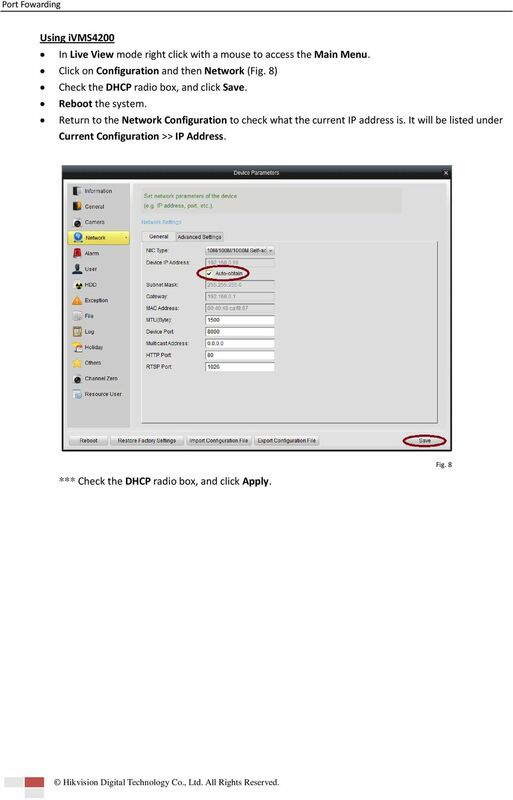 7) Check the DHCP radio box, and click Apply. Reboot the system. 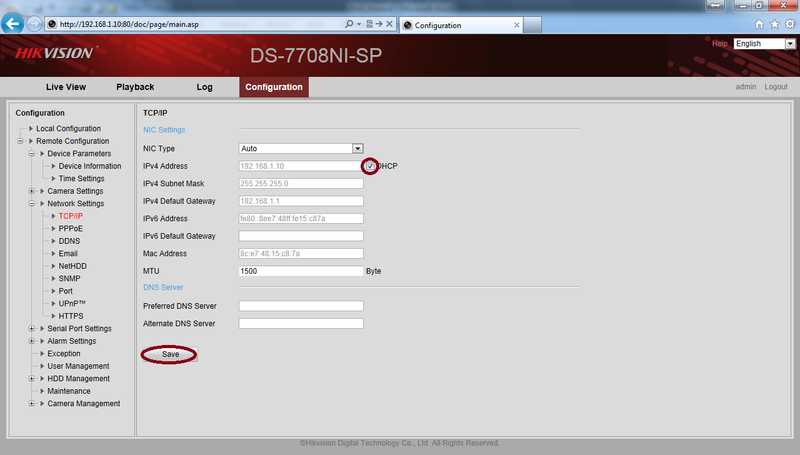 Return to the Network Configuration to check what the current IP address is. Fig. 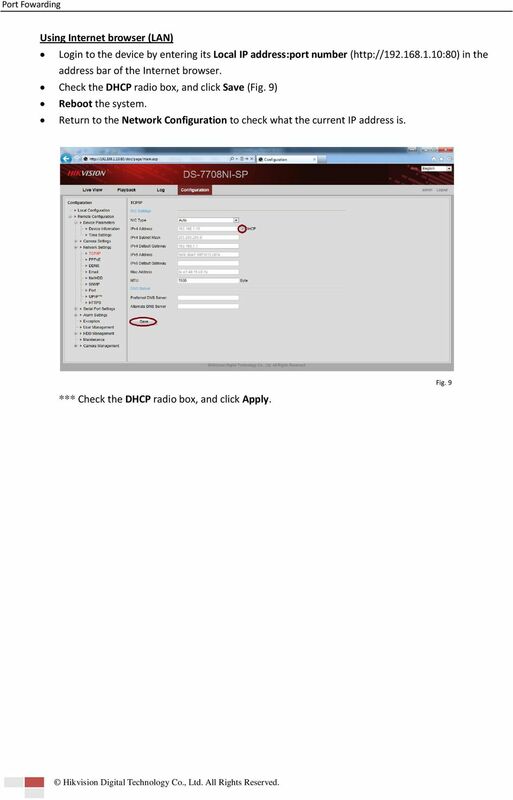 7 *** Check the DHCP radio box, and click Apply. 11 The user login interface will be displayed (Fig. 11). Now you can enter the correct user name, password and port. The default login information is: user name: admin password: port: 8000 Fig. 11 *** Enter the correct user name, password and port. After successfully log in the next interface will appears and you can choose your display layout configuration (Fig. 12) Fig. 12 *** Enter the correct user name, password and port. 12 Select a square where you want to preview 1 st camera. Then click on the camera you want to preview in Live View (Fig. 13). In order to populate the Live View do the same thing for the rest of the cameras. Fig. 13 *** Select a square then click on the camera. 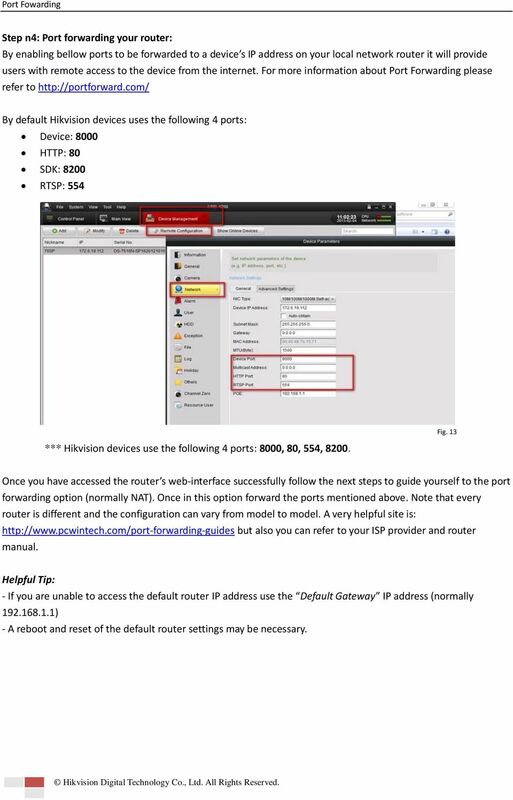 13 Step n4: Port forwarding your router: By enabling bellow ports to be forwarded to a device s IP address on your local network router it will provide users with remote access to the device from the internet. For more information about Port Forwarding please refer to By default Hikvision devices uses the following 4 ports: Device: 8000 HTTP: 80 SDK: 8200 RTSP: 554 *** Hikvision devices use the following 4 ports: 8000, 80, 554, Fig. 13 Once you have accessed the router s web-interface successfully follow the next steps to guide yourself to the port forwarding option (normally NAT). Once in this option forward the ports mentioned above. 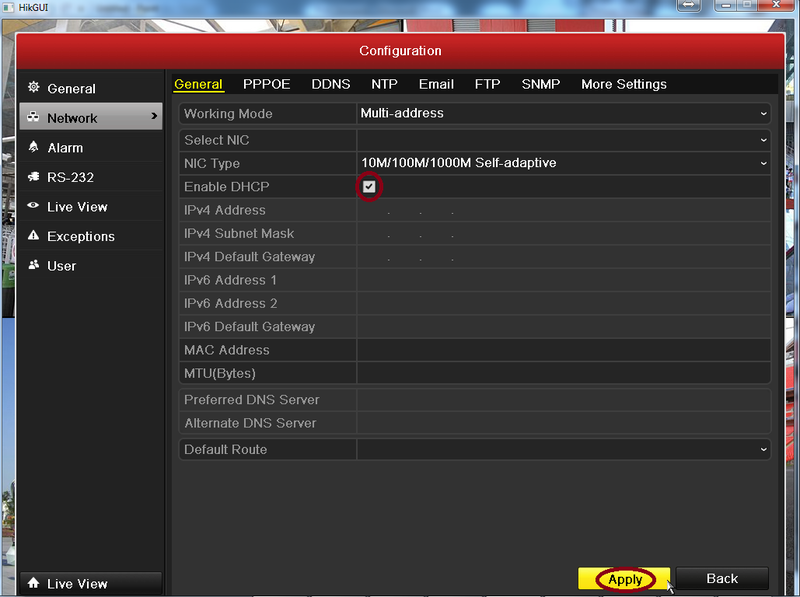 Note that every router is different and the configuration can vary from model to model. 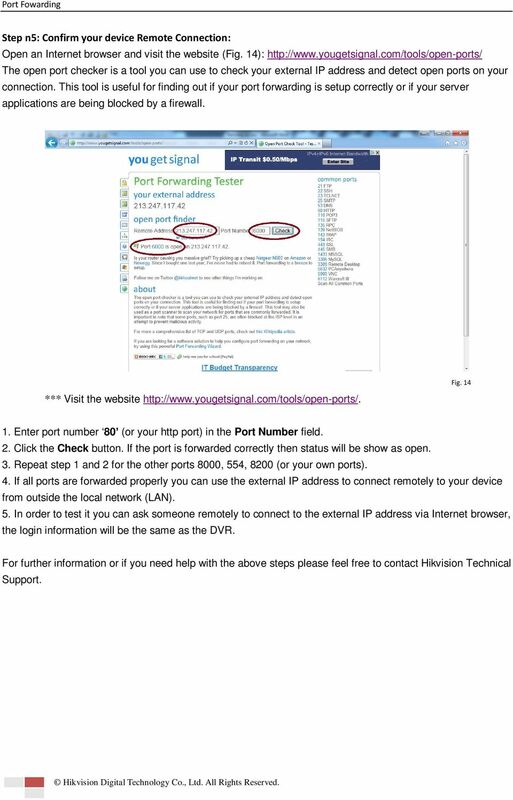 A very helpful site is: but also you can refer to your ISP provider and router manual. Helpful Tip: - If you are unable to access the default router IP address use the Default Gateway IP address (normally ) - A reboot and reset of the default router settings may be necessary. 14 Step n5: Confirm your device Remote Connection: Open an Internet browser and visit the website (Fig. 14): The open port checker is a tool you can use to check your external IP address and detect open ports on your connection. This tool is useful for finding out if your port forwarding is setup correctly or if your server applications are being blocked by a firewall. 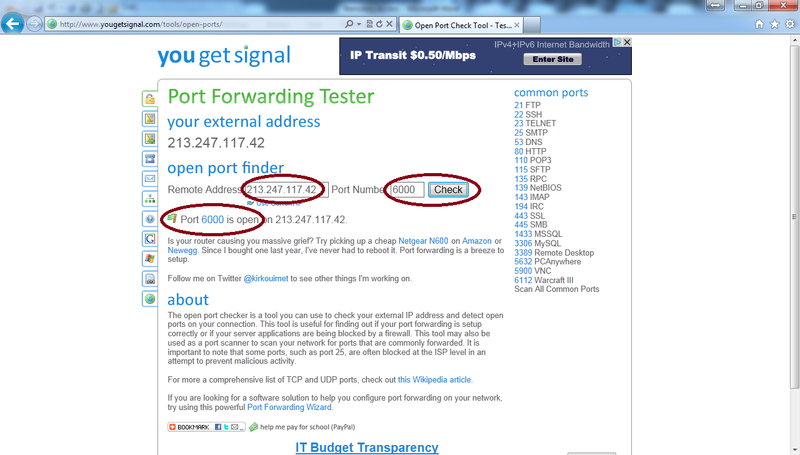 *** Visit the website Fig Enter port number 80 (or your http port) in the Port Number field. 2. Click the Check button. If the port is forwarded correctly then status will be show as open. 3. Repeat step 1 and 2 for the other ports 8000, 554, 8200 (or your own ports). 4. If all ports are forwarded properly you can use the external IP address to connect remotely to your device from outside the local network (LAN). 5. In order to test it you can ask someone remotely to connect to the external IP address via Internet browser, the login information will be the same as the DVR. For further information or if you need help with the above steps please feel free to contact Hikvision Technical Support. IEI emerge and Milestone Systems Network Video Recorder. Setup and Integration Guide. Milestone Version 6.5 and emerge Version 3. 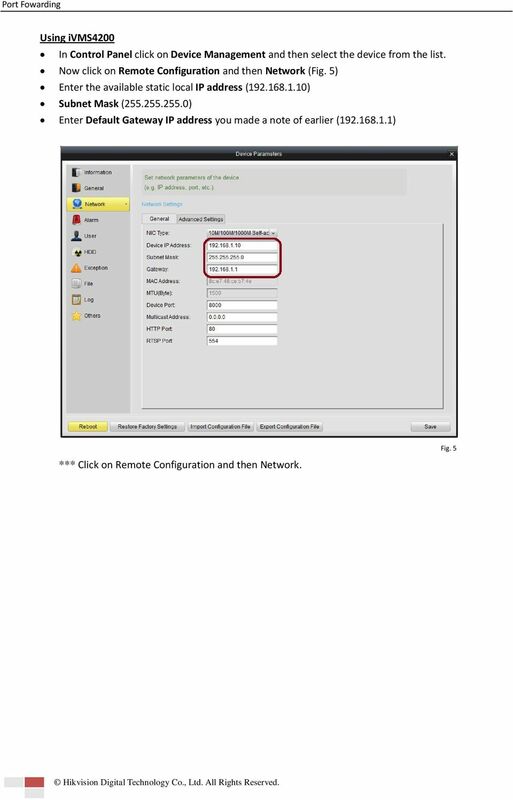 How to configure DVR and computer for running Remote Viewer via IP network Follow these steps to configure a network DVR and a computer with Remote Viewer software to see live pictures via IP network. Use this guide if you are no longer able to scan to Sharpdesk. Begin with section 1 (easiest) and complete all sections only if necessary. 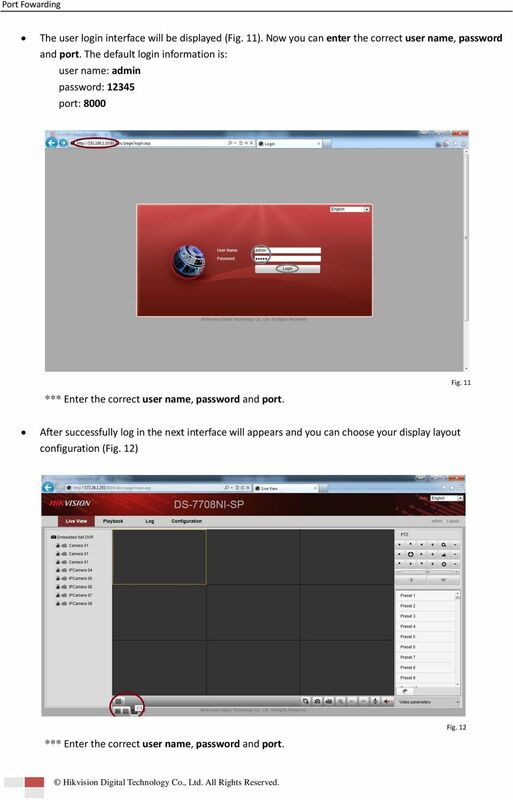 Remote Desktop How-To. 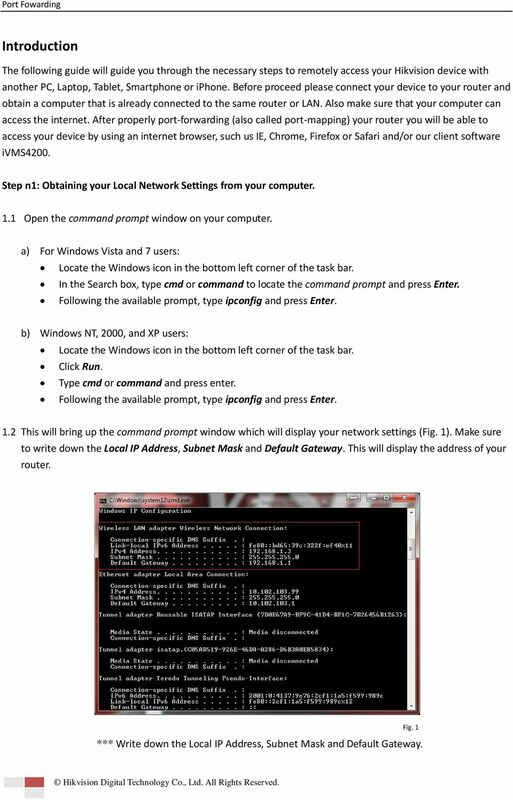 How to log into your computer remotely using Windows XP, etc.